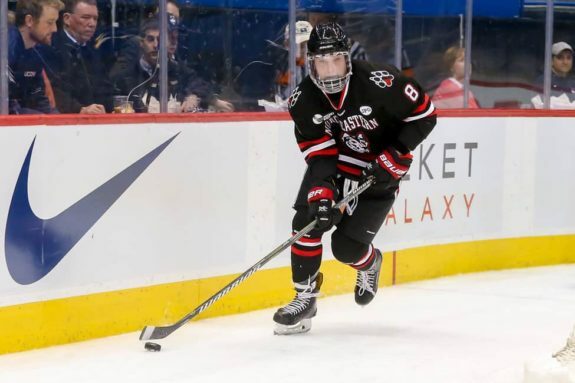 Hobey Baker Award finalist and the NCAA’s leading scorer, Adam Gaudette made his Vancouver Canucks debut Thursday night and he looked pretty solid. The hype has perhaps been over the top in regards to the 21-year-old’s debut, and expectations have not been managed as well as they probably should have. The pressure was on for Gaudette, but all in all, he seemed to handle it really well. In a previous article, I predicted that Gaudette would be skating alongside Jake Virtanen in the bottom six. However, Virtanen is sick so Brendan Gaunce got the call and it was he and Reid Boucher who skated with the former Northeastern Husky. Right out of the gate, Gaudette was flying as he made a quick zone entry and let a hard shot fly early in his first shift. The shot missed the mark, but it was an important play because it probably a took a lot of weight off his shoulders and even showcased some offensive confidence. At the intermission, in an interview with Irfaan Gaffar of Sportsnet, Gaudette said he felt good through his first 20. Overall, he seemed to handle the pressure well out there in the first. He made smart and simple plays, whether that was short break out passes or chip-and-chase plays to get out of his own end. With Mom and Dad among 20 family and friends in the building, he almost found twine on a two-on-one chance with Gaunce late in the frame. It was a hard net-drive that, again, showcased a certain amount of hockey sense and even some confidence. The second period was much quieter for Gaudette, as he took the ice only four times with some pretty minuscule ice time. Trust needs to be earned with coach Travis Green. With that being said, he did get a brief look on the power play with the second unit composed of Nikolay Goldobin, Jussi Jokinen and himself. He appeared to be placed in the slot, likely for some high-slot passing outlets and redirections. I’m no coach, but Gaudette is deadly in the one-timer spot, so Green and the Canucks could certainly benefit from slotting him in there. Gaudette got some more ice time in the third frame and even managed to record his first shot on net. He had some decent zone time and played well alongside the like-minded Gaunce. He looked a little bit soft along the wall and seemed physically outmatched at times. In fact, it seemed to be the theme throughout the night for Gaudette. It’s not college hockey anymore. 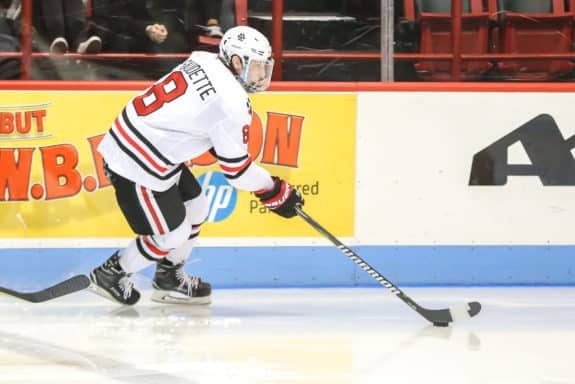 Considering Gaudette only had one practice and a pre-game skate with the Canucks, he looked pretty solid and he should not have disappointed anybody with his play out there. I’m sure a lot of Canucks fans expected a lot out of Gaudette, considering how impressive his season with the Huskies was. He didn’t find the scoresheet tonight, but he did a lot of good little things. Gaudette did not seem too nervous. He handled the extreme hype and immense Canucks-media pressure very well. Went to the net hard at times and was a part of a few decent scoring chances. Only had one practice and one pre-game skate before his Canucks debut. Was almost entirely unfamiliar with Canucks systems. In tandem with the previous note, he was out of position at times in the defensive end. His check seemed to elude him more than once. Luckily though, he wasn’t out for a goal against. Looked soft along the wall. The bigger, stronger NHL players had an easily apparent physical advantage over the Braintree, Massachusetts product. Logged 10:39 of ice time in his debut. Had a second-unit power play look. What did you think of Gaudette’s Canucks debut? Let me know in the comments below!